(1 Customer Reviews) | Write Review 51 issues per year All the biggest showbiz stories of the week, the funniest celeb shoots and interviews, everything you need to know about the world of entertainment, TV, films and music. And shopping! Looking for Heat in print? Unfortunately pocketmags.com does not sell print copies of Heat, but all is not lost. Our partner at magazine.co.uk sells print subscriptions at the best prices online. They’ve been locked in a bitter divorce battle for months, ever since he announced he was ending their marriage in January. 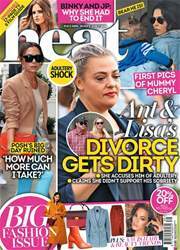 But relations between Ant McPartlin and his estranged wife Lisa Armstrong have turned even uglier, with news that she’s filing for divorce on the grounds of his adultery, after he started a new relationship soon after they split. All the biggest showbiz stories of the week, the funniest celeb shoots and interviews, everything you need to know about the world of entertainment, TV, films and music. And shopping! 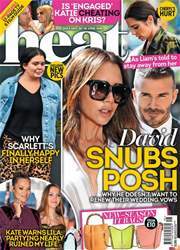 You'll receive 51 issues during a 1 year Heat magazine subscription. You'll receive 51 issues during a 1 year Heat magazine print subscription.